A deeper look into the story of Henry Hill and his life and involvement with the New York City Mafia from the 1950s-90s. The beginning of the book is nearly exactly like its film version (Goodfellas, a classic in my opinion), but if you keep going the story takes new turns not shown in the film, with additional schemes and characters. I enjoyed the different perspectives, with narratives from the writer, Karen (Henry's wife), FBI detectives, and mostly Henry himself. If you have an interest in learning about organized crime, this book is a must. Hard to put down! 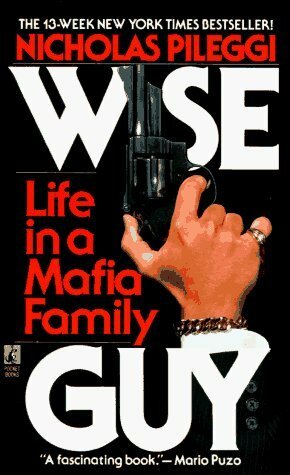 Sign into Goodreads to see if any of your friends have read Wiseguy. necessarily mean in a form of violence. but enough of that! At least i can write my own story, not like H.H. who could hardly spell. Believe me I saw a lot of my own personality in Ray liottas Depiction of H.H. However their r 2 things I would have never done as H.H. did no drugs and no RATTING! will want to c a positive outcome, despite my being rejected by the NYC P.D., I have my opinion and theory as to why I did't get on the P.D. it will come out in my book! come out my book,I am tired of paying the price for other peoples blunders! I hope to get it published so all can read it, it's better than wiseguy& G.F. if a movie is in the works I will request or suggest to the powers to be Sean Penn to depict me "Robert the wise fella "
Did Henry Hill really deserve to get the positive publicty? Doing drugs while in the "life" is big mistake! When a drug addicted individual is going pain & suffering they r more apt to disclose secreative info( that could incriminate a lot of wiseguys, and that's definetly a NO NO! at that point ur no longer an asset u r a major liability! Remember the movie, "THE GODFATHER" Don Vito Corleone, was definetly against drug involvement, yeah it's fast and easy money, but at the end it becomes a major liability, u can't buy people as easily and the life style becomes serverly compromised!